Papers, files, documents, records, reports, archives, information overload! 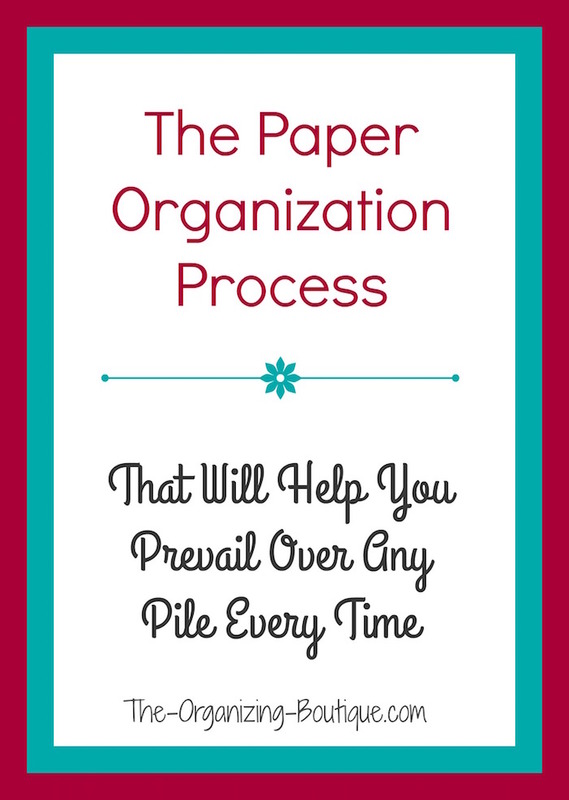 My process for organizing paperwork will help you gain control once and for all. Due to its constant inflow, the overwhelming rate at which piles build up, and therefore, the seemingly insurmountable task of keeping up, paper is a primary source of clutter. How great would it be to locate a specific piece of paper in 2 minutes or less? Would you like to spend less time and effort searching for documents and therefore be more productive? How about reducing stress levels because you have a system and pay your bills on time? Paper organization is important for so many reasons. The following tips on organizing paper files will help you prevail over the piles! Utilize the general organizing procedure of purge, sort and store, and apply it when organizing paperwork. • Start by going through your paper one piece at a time, and decide if it is worth keeping. • In order to make decisions for non-personal information (i.e. ripped out magazine articles), ask yourself appropriate questions (Is this information outdated? Can I access this on the internet?). • In order to make decisions for personal information (i.e. financial documents), refer to Real Simple's record keeping ideas and/or check out this Google search on how long to keep records. • As you make decisions, put the discards in their corresponding pile, bag or box - Recycle (discards without personal information), Shred (discards with personal information), Trash (non-recyclable discards). Free yourself from the paper monster! Half of the battle of organizing paperwork is knowing what to discard. This list will get you started. • As you make decisions, separate the papers you are keeping into general categories (i.e. Financial, Medical, Memorabilia). • After each purging session you complete, take out the discards and store the papers you are keeping in file boxes or file folders in order to maintain the categories you set up. • When you have pared down as much as possible, sort what's left into specific categories using file folders. • For instance, let's sort the file box you created during the purge process of all your important medical documents. Do this by classifying them into specific medical categories such as designating one folder per family member. • It is important that the categories make sense to you, so that relocation is possible and even timely. • Now that your paper files are organized into folders, utilize a file cabinet or file cart to store them. See below for some great paper storage solutions! • Want more details on specific kinds of paper? Here's more organizing bills, organizing office files, pending papers, tax records and using binders. 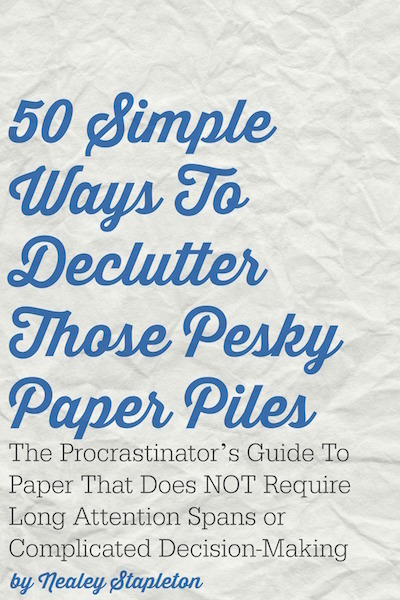 • IN ORDER TO MAINTAIN PAPER ORGANIZATION, IT IS IMPERATIVE TO STAY ON TOP OF THE PAPER CLUTTER EVERY DAY. Take 10 minutes at the end of each day to file papers in their proper places. • It is also a good idea to have an "Action" or "To Do" tray on your desk to house the items that require action. This is a great way to keep these important papers in your line of sight without creating a pile. Here are more paper organization tips on how to organize bills and other actions items. There are tons of storage solutions for organizing papers. The below products are a great place to start. Sturdy, mobile and convenient! This file cart is great for holding your active or current files. It also has two drawers which are great for storing supplies. I use this product as my home office file cabinet and love it! Want to store different categories of paper in colorful boxes? Check out these awesome paper storage boxes. They are pretty, durable and can be used to store anything! You reuse file folders, so why not be able to do the same with the labels?! This product features a permanent marker applied to an erasable label. That's right, an erasable label!! Stackable, stylish and and smooth - this paper organization solution fits nicely on a desk and matches any decor. It is fantastic for holding all of those papers on your desk requiring action. Keep your files organized on the go! This tote is constructed well, has a modern design and convenient pockets for accessories.